This began with SPI and an effort to use more fog of war than the Panzer Gruppe Guderian system was offering. Based on the Wacht Am Rhein system, the thinking evolved into Operation Typhoon, our founding mother/father or whathaveyou and stemed into what is now known as the Victory in the West series that includes Pattons Third Army, Operation Grenade and Sicily: The Race for Messina. I put the system through a filter and produced Iron Tide: Panzers in the Ardennes, after more than ten years of tinkering and delays in production. It lingered on the top ten at BoardGameGeek.com for over 3 years, just to show you that the popularity for the system and its offshoots still exists. After many years of non-production, more and more offshoots of the original have come down the belt including the fabulous The Killing Ground along with its expansion Overlord, to give the system a complete D-Day simulation. Numerous reprints by Command Japan, additional award winning games like Red Star Rising and now, on the horizon, another set of offshoot games is slated to appear if the preorder numbers are met. Don't look for this to go off your radar real soon. I feel that the innovation is not complete in simulating within this system and its relatives. The best part is that it just keeps on coming. Started by TallBlondJohn Jun 6, 2010. Started by Ola Palmquist. Last reply by TallBlondJohn Nov 30, 2009. Started by Ola Palmquist Nov 30, 2009. You need to be a member of Victory in the West series and related games to add comments! This years's Consimworld Expo is flush with Typhoon, VCS Kharkov, Salerno and Iron Tide planned. Latest news is that I have the beta module for Typhoon in my hand. Running it through its paces and it is already beautiful. IMO smokes the old Cyberboard version for versatility, beauty and fun! Fall Blau started in 2007... ;-) The next VCS game will be Kharkov, but timing is up to MMP. Fall Blau is more a derivative of Operation Typhoon, uses strength chits and basic mechanics... but there were a lot of things changed to fit the larger scale. Fall Blau: Army Group South - when did this pop up? I would have expected some notice here but maybe not... are there any other VitW games released since Salerno? How Victory in the West is it - just the use of chits or is the CRT VitW as well? Very tempted but hope its not a supply-strangled slugfest like Typhoon - Something more like Drive on Stalingrad would be very nice. Sorry about all the questions! 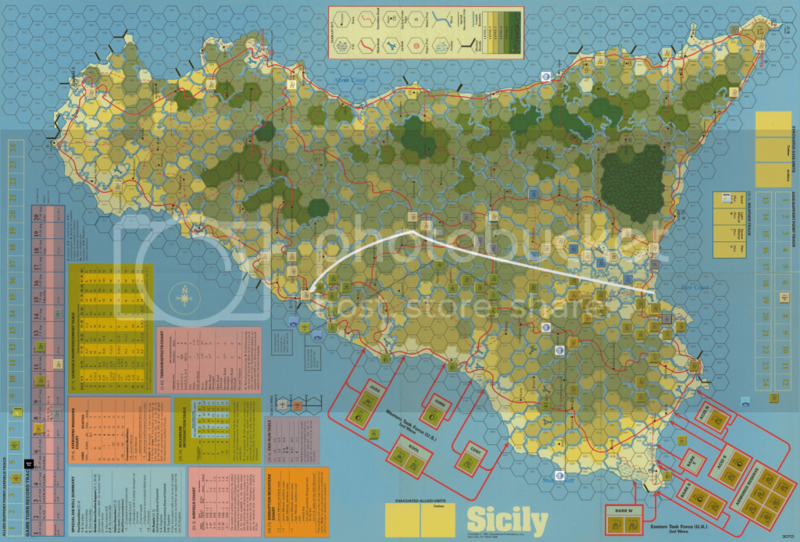 Taking a break from Sicily as Salerno begins shipping very soon. Posting an AAR in the main folder. Axis turn 5 retiring and staging positions for a US push around Palermo to the north road to Messina. in a few more turns. HG and 1 FJ divisions to catania plain and 15Pg with Italian divisions up the middle. Stray Italian formations to the south and west. Here's the Allied turn 4 final. Variable reinforcement die roll was a 12 and resulted in the Italian Mt, division and a tank from the 29 Pg. I will probably pass on the Mt div. What looked like an opportunity in front of the Canadians was limited by the presence of bypassed Italians that prevented strat moves on the way up. Instead these had to be dealt with first while only tank elements forged ahead. Augusta was taken even though the air and NGS support die rolls failed with a D1-1. The US blasted the surviving Livorno regiment and moved up to the inter army boundary vexing any pursuit. That is gone next turn and the horses are running.